You can now upload a subscriber list purely for your dedicated emails! These subscribers will not receive your regular newsletters. They will also not count towards your total audience size or impact the metrics found in insights except for the Email Campaign Metric. 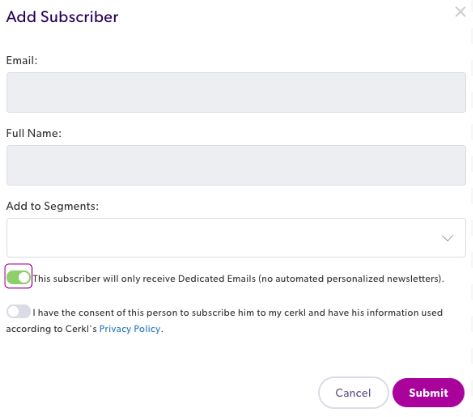 To manually upload a single subscriber go to Audience > Add Subscriber and check the box for "This subscriber will only receive Dedicated Emails (no automated personalization newsletters)". To upload an entire list of subscribers to your email campaign, you will go to Audience > Import Subscribers (the purple button on the left side of the page). Select your file you would like to upload, and then check the box that says "this list will only receive Dedicated Emails." For tips on how to upload an entire list check out our help desk article here: How to Upload an Entire Subscriber List.